San Francisco Pounds Crowded With Chihuahuas Animal shelters are scrambling to find homes for the pint-sized pups. A San Francisco Animal Care and Control official blames the economy and the pocket-pet phenomenon. 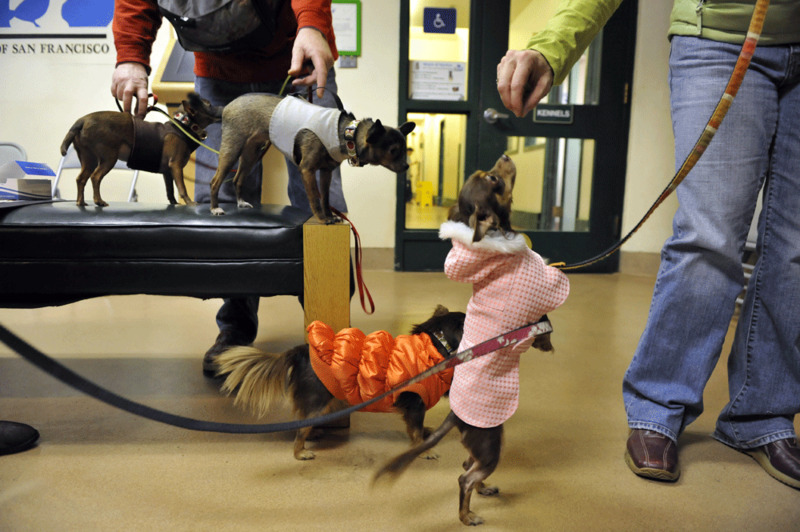 The Animal Care and Control Center in San Francisco has seen an increase in Chihuahuas. In San Francisco, a pint-sized pup is creating a big problem: Chihuahuas are showing up more and more in local animal shelters, and the shelters are scrambling to find homes for them. Kat Brown, the deputy director for San Francisco Animal Care and Control, tells NPR's Robert Siegel that there are 23 Chihuahuas at her pound, a third of all dogs there. "It's extremely unusual," Brown says. In years past, the dominant breed was the pit bull. Not so this year. The culprit? Brown blames the pocket-pet phenomenon that Paris Hilton made popular. The downward economy also has a lot to do with it, she says. Chihuahuas need just as much care as their larger canine counterparts. "Chihuahuas, unlike other dogs, are more difficult to handle sometimes," Brown says. "People think of them as ... stuffed animals ... but, in fact, they're like a little dog, and they need all of the things that a big dog needs."